On exciting new launches, the lovely ladies of Delight.com have just announced the Gent Supply Co.! While i have always loved the selection of goods at Delight, i must admit that the Gent Supply Co definitely leans a lot more NOTCOT ~ not that we’re more boyish over here, but for some reason or other it definitely leans more towards the fun vices like scotch sipping, mad men loving (yes they totally have a Sterling Cooper style section), card playing, gadgets and tech set. Also, i hear that the gift wrap will be less pink tissue paper and more grey kraft paper with a black satin bow! (Delight has always had the loveliest UX when it comes to gorgeous gifts to send to people! So i’m super stoked about a more NOTCOT styled color palette!) 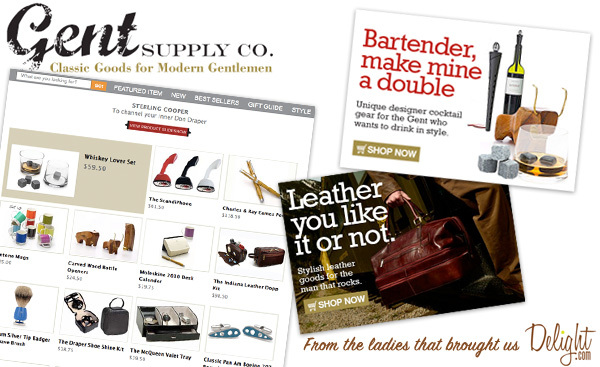 So congrats to Tracey, Lynda, and team on their newest venture, Gent Supply Co.! I can’t wait to see what goodies pop up next!